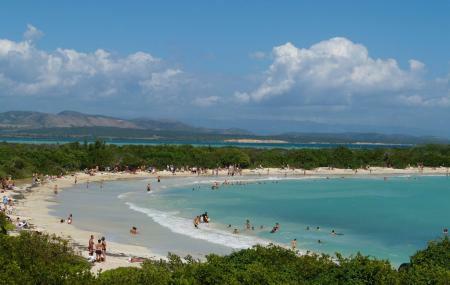 Cabo Rojo is very famous for its beaches, and one of the most well-known of them is Playa Sucia. Part of a natural reserve, Playa Sucia is famous for its untouched and gorgeous shoreline, which overlooks a sea of alternating deep and aquamarine blue water. The fact that it is one of the lesser populated beaches in Puerto Rico, due to its relatively hard to reach location makes it the perfect catch for the traveller looking for some calm and peace of mind. Playa Sucia lies within the boundaries of the Cabo Rojo National Wildlife Refuge, and getting there via dirt roads and trails is an adventure in itself. Getting to Playa Sucia is a reward in itself, as you are greeted by miles of sand and clear blue skies. You can sunbathe undisturbed for hours on end, and you can even go for a dip in the sea. The waters of the Playa Sucia beach are like no other, as they are among the cleanest you will ever find on a beach. You must make it a point to stay there till sunset, which is quite spectacular. Playa Sucia literally translates to ‘dirty beach’, owing to the kelp that washes up on the shore during the year. Don’t worry, the beach itself is in pristine condition. Don’t forget to take the trail to the nearby lighthouse, where the view of the beach will leave you simply breathless. So, while many of you might be looking forward to driving off to more exotic attractions in and around Cabo Rojo, do consider going off the beaten path to visit Playa Sucia. Once you’re there, you will experience tranquillity like you never have before. As mentioned, getting there is a bit of a task. Make sure you hire a local driver who knows the roads well if you aren’t confident of making it there yourself. If you’re going swimming, watch out for kelp and seaweed, which might catch you in a tangle. How popular is Playa Sucia? People normally club together Cabo Rojo National Wildlife Refuge And Salt Flats and El Faro Los Morrillos while planning their visit to Playa Sucia. This is an absolutely beautiful beach! Lots of room, shallow water for swimming, beautiful views! Couldn't ask for more and could have spent a lot more time here! There were several sea turtle nests that had been cordoned off when we were there. The drive trough the salt flats offers great scenery on the way in. Always a great place to come and watch nature, hit the water, and soak up some rays. Saw SO MANY BIRDS... pretty sure the snorkeling in there shouldn't be bad either. An absolutely beautiful beach. Must see. By the light house. No public bathrooms. Being drinks and lunch. Went on a Friday and it wasn't crowded. Told by locals that nats and wasp are in the trees there, so be careful. Might want to bring spray. Clean beautiful beach and spectacular lighthouse on cliff. We could not go in lighthouse, but cliff views overlooking ocean and bay are beautiful. Go here you will not be disappointed. We visited in mid week. Its a Fun beach. Quiet. And with historical importance. It has a Calm atmosphere, local ice cream vendors sometimes go there, which adds a nice treat to beat the heat.